Smog has never been a bigger issue for the Chinese public. While a few years ago most ignored it or were ignorant of its risks, now many people take precautions from wearing masks to staying at home on smoggy days with the windows closed. But is shutting yourself up at home really safe? The answer seems to be, in many cases, no. Wang Qinghua, a home safety inspector in Jinan, East China's Shandong Province, recently found excessive levels of formaldehyde gas, a carcinogen, in 97 out of the 100 households he surveyed, with 72 homes having at least three times of the national standard of gas density. 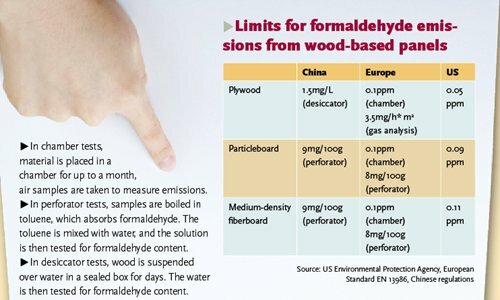 Indoor formaldehyde contamination is closely linked to home renovation, with the gas mostly emitted by composite wood furniture products including particleboard, medium density fiberboard (MDF) or plywood. Some of the houses Wang found with excessive levels of formaldehyde were last renovated five years ago. Studies show that these wood products can emit formaldehyde for three to 15 years. Song says the only way to fight this issue is to eliminate all formaldehyde from furniture. "While putting increasing concern on outdoor air pollution, people should also raise awareness of indoor pollution, which is invisible and might be even more hazardous," Wang told the Global Times. Many people attribute indoor pollution to backwards emissions standards and loose industry regulation. However, Song Guangsheng, director of the National Quality Supervision and Inspection Center for Indoor Environment and Environmental Products, rejects these accusations. "China's standards are actually similar to foreign countries'. Government regulations are strict. The major problem is the trend toward smaller home spaces and over-improvement," Song told the Global Times. The majority of composite wood products do not release excessive amounts of toxins into the air, Song claimed. But when many new pieces of furniture are packed into a confined, poorly ventilated space, the total density of formaldehyde naturally increase and will often surpass the limit, he argued. "The only solution is to produce zero-formaldehyde products. Now a few manufacturers in China have already successfully developed new technology which can make composite wood panels without polluting," he noted. "But due to the novel method and technology, the barrier to promoting this new way of manufacture remains huge." Wang, who runs a home inspection company in Jinan, cooperated with QLTV, a local television channel, and conducted indoor air quality checks at 100 households in 11 Shandong cities in November. The survey showed that only three of the households checked had safe levels of formaldehyde. They were all simply decorated, with just floor tiles and solid wood furniture. 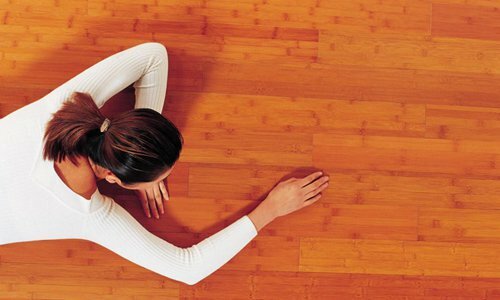 China in 2001 issued formaldehyde emission limits for domestic wood-based panels and finishing products. It says that the formaldehyde emissions of MDF and particleboard used for indoor decorations shouldn't exceed 9 mg/100g (see table) and the emissions of plywood shouldn't exceed 1.5 mg/L. However, indoor pollution didn't decrease after these regulations were released. Song said their survey about 10 years ago showed that air quality in about 60 percent of newly decorated houses was substandard. "But the situation didn't improve. Today's surveys in some regions show that the ratio has risen to 80 percent," Song lamented. Wang believes that the substandard quality of furniture and building materials is the major reason. "There is a huge variety of decorating materials. The makers all claim that they are environmentally friendly. But the facts are always dissatisfactory," he said. Wang and his colleagues recently surveyed six kinds of compound wood panels and found that none of them met emission standards. "The toxic substance emission standards are there, but implementation is poor," he lamented. However, Song disagrees. He said that the authorities are concerned about the issue and check and update the list of rule-breaking manufacturers nearly every month. He argued that the major problem is excessive and lavish decoration. In addition, to pack more rooms into a building, real estate developers tend to lower ceilings, thus room sizes become smaller and the density of air pollution gets more severe. Some media also blamed the problem on outdated formaldehyde emissions limits. According to the US Environmental Protection Agency, the country has changed its formaldehyde emission standards in recent years. Their regulation says that particleboard's formaldehyde emissions shouldn't exceed 0.09 ppm (parts per million). The Worker's Daily claimed this is one 1,000th of the Chinese limit in a report last month. However, experts say the numbers can't be directly compared due to different testing methods. Song added that many Chinese manufacturers have upgraded their technology and voluntarily follow stricter standards than the national limit. Wang doesn't think raising the standards alone can solve the problems in China. "The prices for good quality products will be high, and it will take time for most people to accept them. Besides, manufacturers can always find ways to cheat consumers," he noted. Zhang, a pregnant woman from Hanzhong, Northwest China's Shaanxi Province was uneasy when she moved into a recently decorated apartment with her husband in October. She was worried about indoor air pollution, even though they had put supposedly toxin-absorbing charcoal bags in their house, bought green plants and opened their windows often. She asked for advice on an online parenting community, and to her surprise, nearly all the 46 comments suggested she move out of the house for the sake of the baby. Two parents were even convinced that their friends' kids had caught leukemia from living in newly decorated houses. Zhang's worries are common. In 2006, the country's first lawsuit over excessive formaldehyde emissions aroused nationwide concern and boosted public awareness of indoor pollution. Mawei district court in Fuzhou, East China's Fujian Province, sentenced a decoration company and a panel maker to pay a couple 170,000 yuan ($24,470) in compensation for their role in the death of the couple's daughter, who was diagnosed with leukemia after living in a newly decorated house for a year. Air quality tests showed that the levels of formaldehyde in the house's air was 0.39 mg per cubic meter, nearly five times the national standard for home air quality. In recent years, indoor air pollution-related diseases have been reported more and more, especially those related to formaldehyde, which can irritate the skin, eyes, nose, and throat. High levels of exposure may cause some types of cancers. In 2004, the International Agency for Research on Cancer reclassified formaldehyde from "probably carcinogenic to humans" to "carcinogenic to humans" based on increased risks of cancer of the upper throat. In China, it is often connected to leukemia, with some medical workers finding evidence of this link. After a five-year survey of 570 acute lymphocytic leukemia child patients and 1,000 healthy minors, Fang Yongjun, chief hematology physician at Nanjing Children's Hospital, and his team found a connection between home renovation and developing the disease. They claim to have shown that moving into a house within the six months following its decoration will increase a child's risk of getting the disease 4.76 times, according to a 2012 report by xhby.net, a news portal based in Jiangsu Province. Zhang's mind was not set at ease until her husband spent tens of thousands of yuan on air conditioners and an air purifier which all claim they can help eliminate formaldehyde. However, Song's testing center found that the air purifiers' formaldehyde removal function is ineffective after testing 10 products including seven foreign brands. "Their anti-formaldehyde function was exaggerated, and the severity of indoor pollution was somehow magnified," he said. At a summit on infants' health held in Guangzhou, South China's Guangdong Province on December 13, Zhong Nanshan, a well-known respiratory physician clarified that indoor air pollution has become a major killer. He said that "lavish home improvement is found in 90 percent of leukemia child victims' houses; 2.1 million children die from lavish renovation annually; 70 percent of miscarriages are linked to environmental pollution," the Guangzhou Daily reported. However, Zhong made a public apology nine days later, saying it was improper to quote the unverified figure of 2.1 million child deaths. According to the Database of Death Surveillance in China 2014 released by Chinese CDC and National Health and Family Planning Commission, the total number of deaths of children from all causes between 0 and 14 in 2014 was only 130,000. The 2.1 million figure was first reported by China News Service in 2003 which quoted a child health expert. Since then, it has been widely quoted in reports and articles. No related authorities or individuals have ever made any public corrections. Song, vice director of the China National Interior Decoration Association, said these misinterpretations and overstatements circulating on the Internet have misguided people and intensified public panic. "Some enterprises make use of false information or hype the risks to promote their anti-formaldehyde products," he stated. The market is filled with products to check or wipe out formaldehyde. Some professional companies also offer door-to-door services to help with the problem. "Years ago, the issue of indoor carcinogenic benzene pollution was very serious. But after decade-long efforts to supplant this kind of paint with water-based paint, the pollution is almost controlled," Song said, explaining that the government increased taxes on solvent paints which carry benzene. To help consumers spot zero-formaldehyde decorating products, the authorities have set up a special QR code for them. Despite the technological barriers, Song said industry regulators have pledged to control formaldehyde in home decoration products within 10 to 15 years.